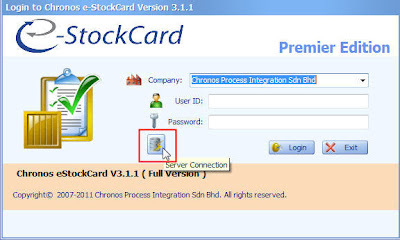 Run the eStockCard program at the eStockCard inventory software Client PC. A message might appear to show that it is unable to connect to the database. 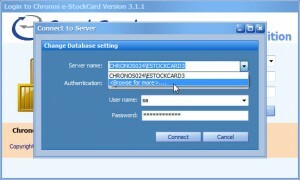 Once the eStockCard login screen appears, just click on the “Server Connection” button. If the eStockCard Server PC IP address is known, just enter the IP at the Server name column and then click Connect. Please maintain the default Authentication, User name and password. eg: If the IP is 192.1.1.1, at the Server name column just replace CHRONOS024 with 192.1.1.1. Therefore the server name column will be: 192.1.1.1\ESTOCKCARD3. Otherwise, you could also manually browse for the eStockCard warehouse system Server PC by clicking the Server Name drop down list and select <Browser for more>. 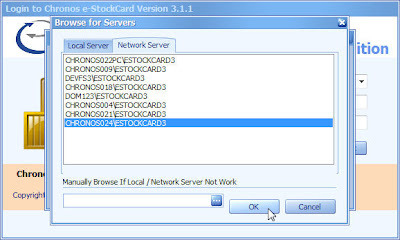 Select the eStockCard Server PC name from the list and then click OK and Connect. Now the eStockCard Client is connected to the eStockCard Server database.